However, I think it will definitely be worth it, as I will be reliving my childhood next April! It was a concert ticket, for the "ultimate supergroup". Can you guess what it is yet? 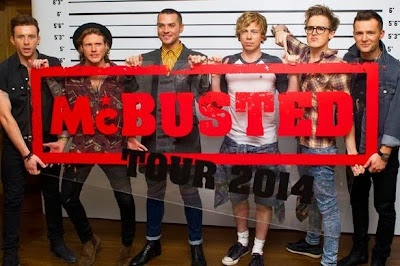 It is of course, McBusted! (Also known as Mcfly and Busted). If you don't know who they are, Busted are a band that split up when I was younger, but I loved them, and Mcfly are another band who were around at the same time as Busted, and they are still going today. They have teamed up together to create "the ultimate supergroup", and of course I bought tickets, i had to, didn't I? I am very excited for this. As a little end note, I thought i'd let you all know that i'm going to attempt to blog every day up until Christmas (i think it's nicknamed 'blogmas'? ), starting on the first of December, but i''m not guaranteeing that it will happen every day (even though I am going to try my very hardest) as this is a very busy time of year for me (and most people), but I have the added stress, as do many young people, of getting my University applications in by mid December. How scary has that? Where has the year gone, seriously?! Quite a short post, and I probably won't blog again until the first of December, but there is lots of things coming up soon! (includng a few 'artistic' blog posts, some product reviews, more fashion posts, and a product empties video, to name a few!) See you soon!